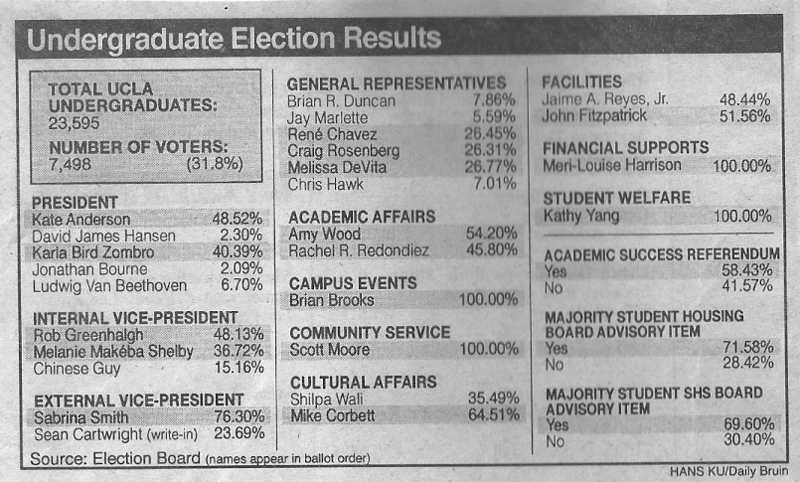 While attending UCLA in the '90s (as of all things a Theater major), I discovered that to run for Student Body President, all you needed was to get 75 students to sign a form supporting your candidacy. I walked around campus with the petition and got 75 strangers to sign it. Then my campaign began. The thing is, I didn't stand for anything. Having a platform never even occurred to me; I just wanted to be on the ballot. I raised no money — I had only one campaign sign, and it was made with scrap wood and a magic marker. 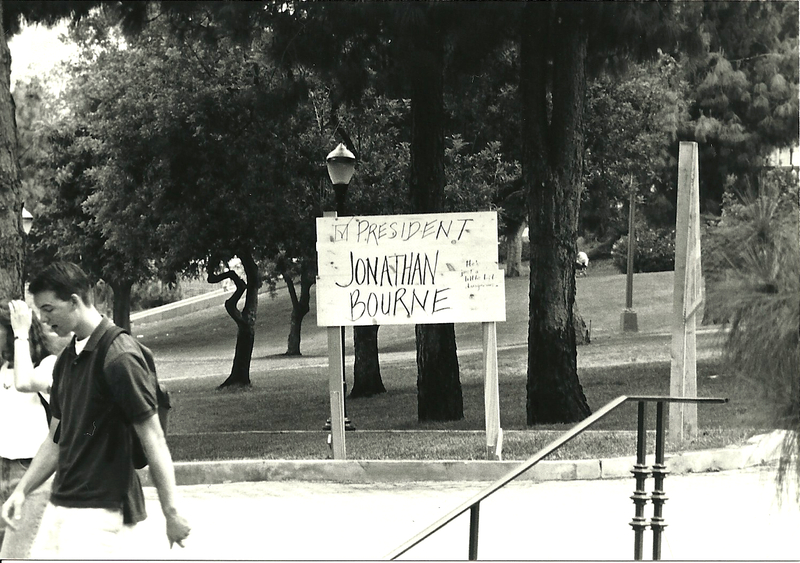 For a while, my campaign slogan was "Jonathan Bourne: 75 people can't be wrong!" But eventually I decided I would blatantly pander to the electorate. Hm... what issue could I champion that would make college kids vote for me? And that's when I hit on the idea of a campus bar. I claimed that UCLA was the only UC school without a campus bar. To this day, I have no idea whether or not that's true. When the Daily Bruin asked for my platform, I submitted one that proposed shutting down the Daily Bruin and replacing it with a weekly magazine resembling the nation's most popular periodical, TV Guide. With the savings, we'd open a UCLA bar. The editors did not take kindly to my platform. 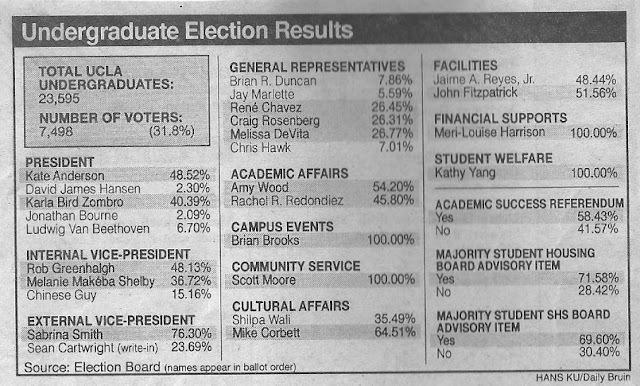 Despite my drunken co-ed bait, I lost the election (coming in behind a student who ran as "Ludwig Van Beethoven). As a result of the 2% of the electorate who voted for me, no candidate received enough votes to win the Presidency outright. This would trigger a runoff election between the top two candidates, one of whom was Kate Anderson. Much to my amazement, I received a call from Anderson asking if I would tell my "constituency" to throw their support behind her in the runoff election. Constituency? I didn't even know anyone who voted for me! Nevertheless, I told Anderson that I'd alert my voting bloc to support her candidacy — in exchange for being named "Theater Czar." Needless to say, after Anderson won the runoff election, I never heard from her again. Twenty years later, Kate Anderson is running for Los Angeles Unified School Board, District 4. Though Anderson does have that valuable experience from being UCLA Student Body President, on March 5th I intend to write in my vote for LAUSD School Board Director: Jonathan Bourne. Because 75 people can't be wrong. "The Gossip Game is executive produced by Brian Flanagan, Matthew Ostrom, Laura Palumbo Johnson and Sean Lee for Magilla Entertainment, with Tom Ciaccio serving as co-executive producer." "Also executive producing are Tone Boots and Jay Griffin for District Media and Mona Scott-Young for Monami Entertainment." "Executive Producers for VH1 are Brad Abramson, Warren Cohen, Shelly Tatro and Jeff Olde." Only a dozen EPs for a docusoap? Gosh, I hope that's enough. 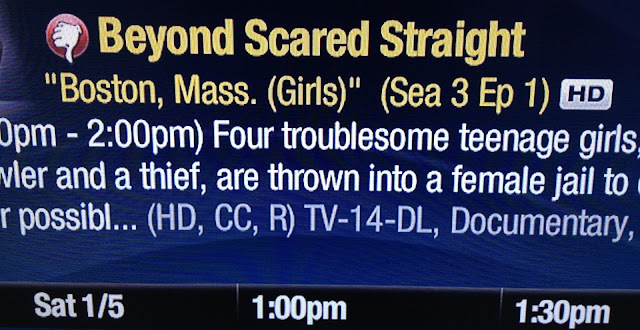 This was on TV the other day. What exactly is Beyond Scared Straight? Scared Gay? 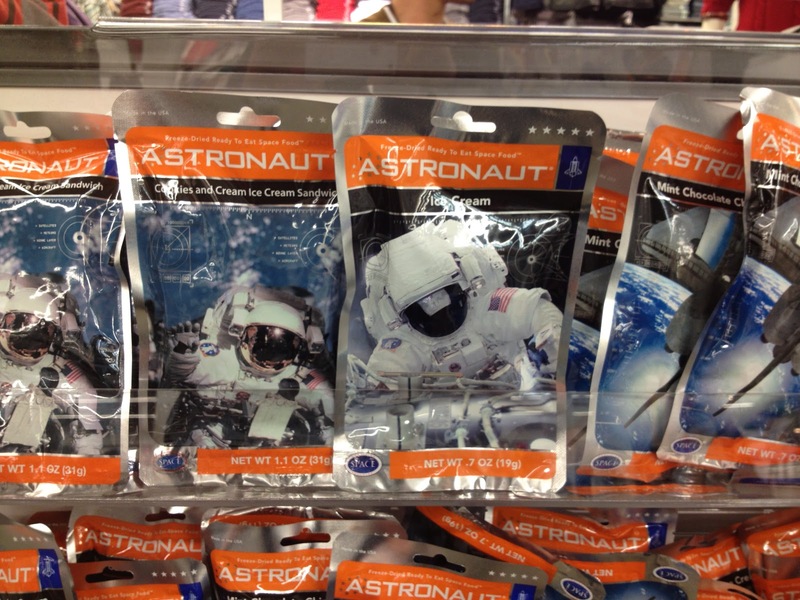 It's sad that astronaut ice cream outlasted astronauts.